Mary made sure that when Darragh O’Brien TD was appointed Fianna Fáil Spokesperson for Housing to put Dublin Centrals Housing crises right at the top of his agenda. After Mary brought Darragh to visit O’Devaney Gardens and other wastefully under underutilized state-owned lands in Dublin Central he challenged the Government in Dáil on their shameful failure in Dublin Central. On a positive note this challenge appeared to have spurred the Government into action. Unfortunately, they can’t help themselves for trying to PR and spin their way out of every situation and sure enough a Government press release was issued, the media invited and a sod was turned, again! Mary says everyone knows that to really develop O’Devaney Gardens to its full unique urban potential will take more than media photo-ops and sod turning ceremonies. 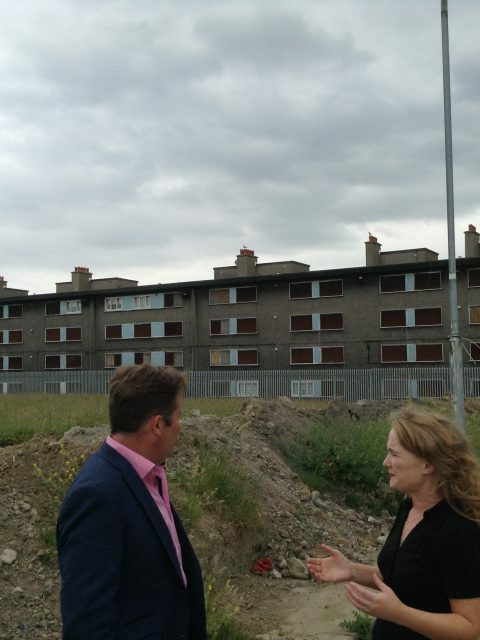 O’Devaney Gardens is a 14 acre, state-owned site, zoned and serviced for housing with huge potential that this and the previous Government has shamefully failed to develop despite the worsening housing crises. While Mary welcomes the Government finally after 10 years announcing the beginning of construction it highlights the paucity of their ambition that they have only funded 56 units on a 14-acre site which should be used to provide hundreds of quality affordable sustainable homes. Mary says O’Devaney is state-owned land; it should be used for the benefit of the people and we simply cannot wait another 10 or more years for the site to be properly developed. Mary renewed her call on the Government to get real with an accelerated plan to put the site to full productive use to address the chronic housing need. Darragh O’Brien TD has committed to continue to work with Mary and keep the pressure on the Government until they make a real commitment to delivering affordable homes in Dublin Central.